"It's useless to compete with very young girls who are playing protagonist roles in most serials today"
It's a pleasant surprise when one sees her for the first time, shorn of the burden of age that dogs her on screen. If Kamalika Guha Thakurta aka Gayatri Chachi of Kyunki Saas Bhi Kabhi Bahu Thi does not look even half the age she portrays in the serial, blame it on the make-up man who convincingly portrays her as a mother to a 40- year-old son. This dusky Bengali beauty, whose acting skills need no introduction to a Kyunki.... regular, would easily qualify as an answer to a search for a protagonist in a 25-year old age group. Read on for a tete-a-tete with Vickey Lalwani at the Sankaram Studios, Goregaon. How did you get your first break on television? Towards the end of the show, Rajnish and I became husband and wife. Since Rajnish was from Mumbai, we settled here. Why was 'Mujhe Chand Chahiye' wrapped up in a hurry? Yes, it was. Initially, it did well. But after a period of time, it was not able to sustain high TRPs. How did you get into the Balaji camp? Did you jump at the 'Kyunki...' offer or did you ponder awhile? I don't remember whether I jumped, but I won't ever forget my first reaction when I arrived on the sets. Looking at me, Savita and Ketki said in Gujarati 'Yeh chokri hamari devrani banegi?' (Will this chit of a girl play our sister in law?). And then, when I learnt that I had to play Shakti Anand's mom and JD's wife, I beckoned to the EP and told her that this was not my cup of tea. However, most artistes from the Kyunki... cast came forward and explained that I should not let this opportunity slip away. I don't know why, but something made me believe them. I began to get a gut feeling that this serial was going to be a big thing one day. "It can't be just the sarees and the jewellery that makes 'Kyunki...' tick"
Don't you regret that you got slotted into the 'devrani' bracket? This serial has put me in a certain age group which is older than what I actually am. That, in turn, does straitjacket me into the 'devrani' bracket. But it's mindless to crib about these things because very young girls are playing the protagonist roles in most serials today. It would be useless to compete with them. The scenario has changed. Why shouldn't I make use of whatever opportunities I get, subject of course, to the fact that the work is good and respectful. Still, does this serial offer enough scope to your acting abilities? It's a fairly good deal. If you recall, earlier it was all focused on Savita, Ketaki and I. Now, those days are coming back. If you have seen the past few episodes, Savita and I have been having tiffs. And the third fight-master Ketaki Dave is coming back? (smiles). Yes, she is coming back on 3 July - the third anniversary of the show. What did you all feel when she dropped out? We all told her not to go. It was a petty misunderstanding. We thought it could have been sorted out then and there. But I guess, it snowballed into an ego clash. What did you feel when Amarr Upadhyay walked out? We tried our best to convince him that he should not leave. We told him, 'If Amitabh Bachchan could do television, why can't you?'. But he stuck to his decision. But I have heard that he is coming back? Even I have heard this. I don't see why he would. Ronit Roy is doing a great job as Mihir Virani, I wonder where and how Amarr would fit in. It would be unfair to the audience. But then, Ektaa knows best. You are also doing 'Kya Haadsa Kya Haqeeqat' now? Yes. But this Balaji serial has me as a 28-year old girl (smiles). In this current series, I play a tarot-card reader sort of character. Urvashi plays the negative part. I use my knowledge and powers to nullify her. As an artiste, I am enjoying myself. It's very different from normal socials. Going back to 'Kyunki.....'. Do you think it's easy to live in such a big family in today's times as the serial propagates? Well, my father has six brothers and presently they all live in the same house, rather, the same building. They all have separate kitchens and separate businesses. They connect as and when they want to. Therefore, I have seen the pros and cons of living together and separately, both. Given a choice in today's times, everyone would prefer a nuclear family. But I think people do connect to this serial in some way. It can't be just the sarees and the jewellery that makes it tick. Anyway, let's not forget that, after all, it's fiction. "I must say that each one of us is very happy with the look we have presently"
Were you comfortable when they took the 20-year leap and changed your look? Honestly, I and practically everyone were extremely apprehensive about the change in our get-ups that was inevitably going to happen. The show and the image given to us by it, meant a lot to everyone. We were unsure if the audience would accept us in our new 'avtaar'. There were lots of meetings between the actors, producers and channel guys. We explained to them that we didn't want to be projected as caricatures. None of us was so old to have wrinkles or black circles under our eyes. Television takes lots of close-ups and very soon it would have shown that the wrinkles and the black bags are artificial. On stage, these things are okay. You are at a distance and you can divert the public. On TV, nothing can go unnoticed. Eventually, we took the middle road, and I must say that each one of us is very happy with the look we have presently. Was the 20-year leap taken because the TRPs were falling? Television is all TRP business. It must have been a joint decision by the channel and the producer. Besides, bringing in more characters, I mean the Generation Next, must have been done to have more tracks to work on. Is bringing in Ketaki Dave also a TRP driven move? I don't think anything is wrong with the present TRPs. They are pretty high. The day or maybe the week that Ketaki enters would find a rise in TRPs, but beyond that, the story has to maintain the viewer's interest to sustain the good position which the serial is presently in. What is difficult on television? The time to prepare for a scene is too little. It all boils down to 'episode ready karna hai'. You need to get it right almost instantly. Unlike in films, there is no time for improvisation, there is no time for breaks. But like every coin, even this one has two sides. To get everything right almost instantly, we need to be tremendously focused. We develop high levels of concentration. Every day, we grow as an actor. What is the role you yearn to play? I have done good roles in Kamal, Manzilen and Babuji, though I had to wind them all up due to my pregnancy. I have a nine-month old daughter. We have named her 'Khushi'. I would love to have a tryst with comedy. Have you thought of joining films? I get calls, but I am not going to sign until I get a role of substance. Your co-stars whom you gel most with? 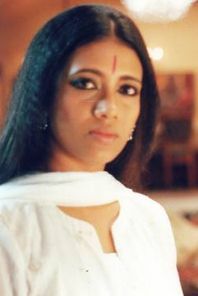 Sudha Shivpuri (Ba), Apara Mehta (Savita), Smriti Malhotra (Tulsi). Television is taxing. How do you manage with your baby? My mom has come down to stay with us. And I make at least 20 calls every day to check if everything is fine (smiles).